Did Race Cost Obama in 2008? The estimates imply that racial animus in the United States cost Obama three to five percentage points in the national popular vote in the 2008 election. In this paper, I introduce a relatively unobtrusive measure of racial salience to examine whether these initial interpretations are correct. I find that when race was a more salient factor for White voters, they were substantially less likely to vote for Obama and were more likely to think that Obama was focusing attention on African Americans during the campaign. I estimate that the salience of race for some Whites may have cost Obama as much as 3% of the White vote. Thus, this paper indicates that even in Obama’s historic 2008 campaign, African American candidates continue to face barriers to winning White support. If you had to vote in an election but did not know any of the candidates competing, which pieces of information would be most useful for helping you decide who to vote for? Then respondents simply asked people to rank several factors, including the candidates’ race, in terms of their usefulness. Schaffner finds that the higher people who ranked race as more useful were less likely to report voting for Obama—a relationship that was most evident among racial conservatives (in this study, opponents of affirmative action). In fact, the effects in these studies are comparable to the effects in other studies that do rely on explicit measures of racial prejudice. Although it is true that some people may be reluctant to reveal those sentiments in a survey interview, many people will. So Lewis-Beck, Tien, and Nadeau estimate that racial prejudice cost Obama 5 percentage points. Josh Pasek and co-authors arrive at the same estimate: 5 points. However, a lot hinges on the relevant counterfactual. Stephens-Davidowitz imagines that every media market has a level of racial prejudice equal to that of the least prejudiced market. Pasek et al. study simulate the absence of both pro- and anti-black sentiments. The Democrats would have won the 2008 election regardless of who they nominated, but the average Democratic party nominee from the last 16 years, and either of Edwards or Clinton, would have done better against McCain than Obama, although in Clinton’s case, not by much. What is “by much”? Half a point. But Edwards would have done about 3 points better—an estimate commensurate with those above. So contra my very preliminary back-of-the-envelope analysis a few months after the election, race may have cost Obama in 2008. But the hypothetical Clinton vs. McCain race is important. It’s not enough just to imagine a world without racism—whether measured with explicit questions, implicit questions, or Google searches. It may be equally relevant to imagine a world without a black candidate. UPDATE: See also the study by Benjamin Highton in the comments. Donate Your Data to Science! 17 Responses to Did Race Cost Obama in 2008? “Edwards would have done about 3 points better” . . . That statement is, I assume, conditional on his private life staying private? In fact, Schaffner estimates Obama would have lost only about 2% of the *total* vote share. That’s a potential difference of 1-4 points from Stephens-Davidowitz’ finding, and the lowest estimate of all the studies cited. So, do you still consider that sufficiently similar to the others? Andrew: Given all the assumptions that go into these counterfactuals, any point estimate will have substantial uncertainty. So I don’t see the difference between 2 points or 3 points or 4 points as meaningful in the statistical sense. ok thanks for the reply. Any indication how this would have translated down the ballot? Would the Democrats have had 61 Senate seats, or 2-3 more House seats as a result of Obama being “white” or nominating Edwards? This is what I am most interested in. To go further: I would like to suggest, based on the polling of 2007-08 and on his perceived ideological moderation, that John McCain was a pretty darn good candidate. Imagine a scandal-free John Edwards vs. a generic Republican, right after the financial crisis. I have three words for you: FIFTY STATE SWEEP! But, are these researches taking into account the higher turn out and share of the black vote that Obama got? They’re specifically talking about the White vote. A lot of Obama’s surge in the black vote had to do with the President’s campaign getting more Black voters to the polls and voting. There wasn’t a sudden shift of Black Republicans leaving to vote for a Democrat but there was a surge in the number of Black people voting for President. A lot of that was due to the campaigns early voter registration drives targeting mainly the untapped markets of young voters, minorities, and the elderly. 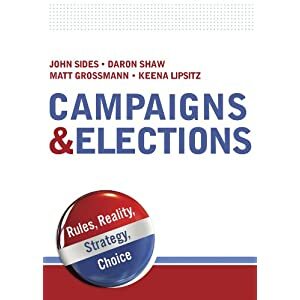 I haven’t looked at all of this research in detail, but the aggregate analyses (Highton and Stephens-Davidowitz) seem to suffer from the problem of an endogeneity/omitted variable, namely campaign spending/mobilization. If the Obama campaign believed these racially prejudiced states to be out of reach (for a variety of reasons, but one of them presumably because of the problem of race), then they would not put a lot of effort into getting white votes in those states. I suppose I buy that he is getting marginally dinged in many of these red red red states for reasons of race, but what happens if these authors limit the analysis to states where there was a decent chance for Obama? Say, anywhere above 35% eventual nonblack support for Obama? Or even directly controlling for campaign spending or mobilization. I just cannot tell which states are driving the findings here, and thus whether this “matters” or whether it doesn’t really matter (the effects are mostly in places where it didn’t matter if he won more white votes). i would say “in those areas of those states”. In Georgia, for example, whites in atlanta and the metro area have little to do with those in, say, the countryside around cartersville or rome. Do any of these analyses take into account the flip-side of the coin? I believe Tesler and Sears argue that racial liberals were MORE likely to vote for Obama than they would have been if he were white. I have no idea what the prevalence or magnitude of this effect might be, but it seems important to consider. I agree with Scott. It doesn’t appear any of the studies ask how much Obama’s race helped him win the election. The 2008 election had a high rate of voter turnout, with a relatively high turnout among younger voters. How many people would’ve switched their vote to McCain and how many would’ve simply not gotten out and voted if Obama was white? Is it less than the 5% he was supposedly hurt by, greater than the 5%? Joe and Scott: See the Pasek et al. piece. They simulate (a) the elimination of anti-black attitudes and (b) the elimination of pro-black attitudes — as well as both at the same time. Moreover, they take into account the possibility of abstention. Thank you, Dr. Sides; I enjoyed this post very much. Black Democrat (perhaps even after controlling for such factors as partisanship and ideology). So a strategy of examining the association of racial prejudice and voting behavior might suffer from this problem of a confounding variable. presidential election dating back to 1996. Other scholars have also been aware of this issue. For example, Tesler and Sears’ book used a similar strategy to mine (but a different measure of prejudice, racial resentment) and Stephens-Davidowitz controlled for Kerry vote in 2004. Donald R. Kinder and Allison Dale-Riddle have a forthcoming book on the topic as well. Finally, it’s interesting to note that while scholars appear to be in agreement that racial prejudice hurt Obama, the literature on the broader topic of whether White voters discriminate against Black candidates has yielded mixed results. For example, Dr. Highton’s 2004 article in Political Behavior, one of my favorite research projects on this topic, finds “remarkably little” evidence of White discrimination against Black candidates for Congress. It is interesting that race was never overtly brought up in the election of 2008 and the election of 2012. It would be interesting to look at the why race wasn’t a factor from a psychological perspective: aversive racism and contemporary racism as well as other factors.